Tom Ferry Real Estate Coaching and Training. The place to go when you're looking for new strategies, new ideas and motivation in your business/life. Remember, strategy matters and passion rules! Trust you are doing well! I just wanted to compliment Paul's work and your Company's reputation. Paul came by my house in Braintree today to repair the crack in my garage. Paul did a great job and was pleasant and friendly to talk to while doing the work. You are fortunate to have a reliable and professional staff like Paul. He was on time and thank you for keeping your word of completing the job. With that being said, I will continue sending clients to your way going forward. Also, would love to have you back as my guest on my tv show, Real Estate Focus in the upcoming shows. I will be in touch about it within the next few weeks. Compliments of A-1 Foundation Crack Repair, Inc. Compliments of A-1 Foundation Crack Repair, Inc. 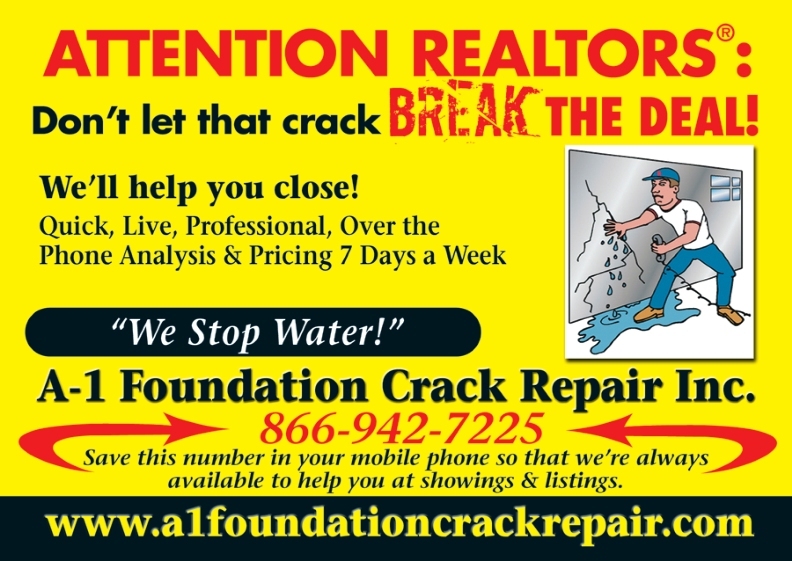 Contact A-1 Foundation Crack Repair Inc.